Bubble Man a boss from Mega Man 2. 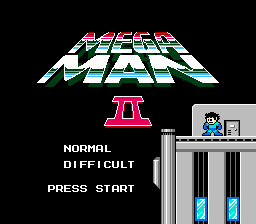 Mega Man 2 released in 1988 by Capcom for the NES. 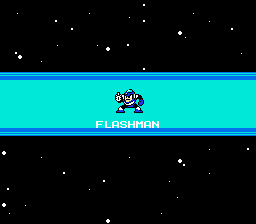 It was the sequel to Mega Man which was a good game but Mega Man 2 placed the series on the map to stay. 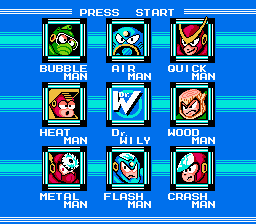 The evil Dr. Wily has 8 new bosses for you to defeat: Air Man, Bubble Man, Quick Man, Crash Man, Flash Man, Heat Man, Metal Man, and Wood Man. After you defeat each boss you get a unique weapon that you can use for the rest of the game. 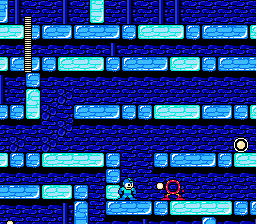 Mega Man games have always been challenging and this one follows the same formula. The gameplay is the classic mix of action and platforming rolled into one. The music is still hailed to this day as some of the best video game music ever. This game differs from the original NES game in that you can collect an energy tank (it has a letter E on it) that will refill your health when used. The only other new feature was tha you now have a password system so a player could continue their game progress at a later date. This is the highest selling Mega Man game Capcom has ever released and it’s also known as the most popular game of the series. The graphics look much like the first game but that’s a good thing. The controls are tight and responsive. The music is absolutely classic in fact it’s known as one of the best soundtracks of any game on the NES. The music to this day is constantly remixed due to it’s quality. Chip Tuners around the world love this music and it’s easy to understand why. If you haven’t played this game you really need to! It’s very inexpensive and it should be a part of any retro gamer’s collection.